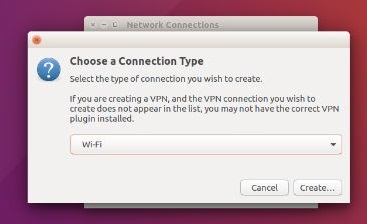 Before you start to create WiFi Hotspot in Ubuntu 16.04, disable WiFi and plug in a wired Internet connection to your laptop/PC. Please makes sure that the Ubuntu is connected to a wired Internet and wireless is disabled. 1. Disable WiFi and connect to a wired Internet connection. 2. Go to Network Icon on top panel. 3. Select Edit Connections and then click the Add button (in the pop-up window). You can also select Create New WiFi Network. 4. Choose Wi-Fi from the drop-down menu (under connection type). Type in a connection name. Please note this name as we will use the name later. In Wifi Security tab, select WPA & WPA2 Personal and type in a password. 6. Go to Wi-Fi Security tab, select security type WPA & WPA2 Personal and set a password. 7. Go to IPv4 Settings tab, from Method drop-down box select Shared to other computers. 9. Now connect to the WiFi Hotspot created.